U.S. stocks ended sharply lower last week due to continuing concerns over China's slowing economy and uncertainty with the Federal Reserve as to when it will begin raising interest rates. Volatility was again the watchword for Wall Street last week as the S&P 500 fell 2.96% on Tuesday after China's official Purchasing Manager's Index (PMI) fell to 49.7 in August, the lowest level in three years. Equities partially recovered Wednesday, encouraged by an increase in worker productivity and relief that Chinese stocks ended little changed overnight. China's markets were closed Thursday and Friday last week in observation of the end of WWII, 70 years ago. Markets ended Thursday, only slightly higher, as optimism over further European Central Bank easing gave way to jitters ahead of the August jobs report. 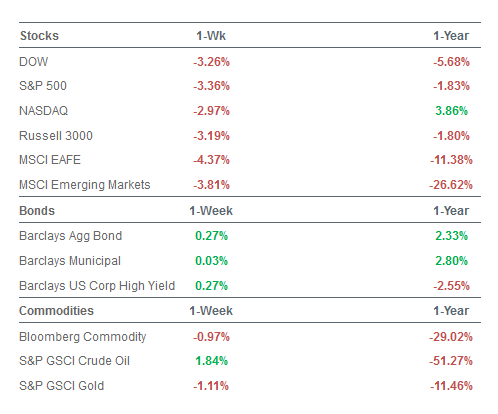 For the week, the Dow Industrials fell -3.26%; the S&P 500 lost -3.36%; and the EAFE (Developed International) dropped -4.37%. 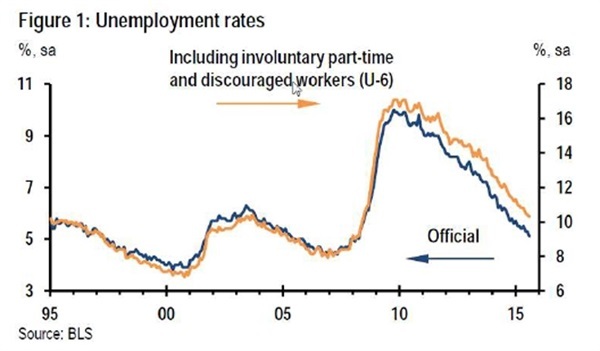 The unemployment rate has reached the FOMC's latest central tendency estimate of NAIRU, 5.1%, declining a full percentage point over the past year, and is a half percentage point below its 1Q15 average. Simple extrapolation of recent trends would forecast an unemployment rate below 4.5% in mid-2016. The broader U-6 measure of unemployment shows more slack, but U-6 has been coming down by a faster 1.7%-pts in the past year. Overall, payroll growth slowed to 173,000 for August, but the trend is still 200,000 or more.